We are all aware that communication is the lifeblood of any business venture and the first port of call is often make or break with landing a new customer or deal. Yes, that’s right, it could all cease right up at the humble receptionist or automated attendant that answers your business telephone system. I heard a story just this week about how sick a business owner felt when she called into her own office, only to be greeted with “hello” on the office telephone. If I was calling to enquire whether they could build my million-dollar dream home, I certainly would not have taken the conversation much further myself. Frankly, there is too much competition in business these days to allow for the inefficiency of poor staff or second-rate services. Services can range from the tangible offerings you provide your clients, right down to the type of business phone you have sitting on your front office desk. You need the best and the most efficient to thrive in today’s business landscape. 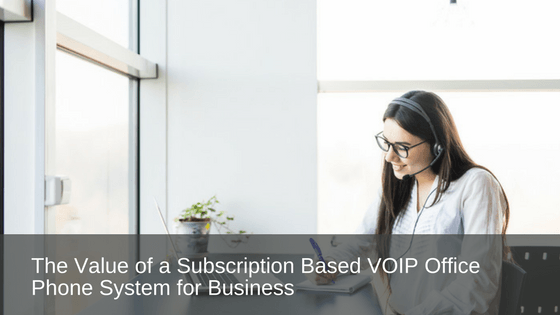 In this article, we will highlight exactly how this business owner could capitalise on a cost-effective, subscription-based VoIP office phone system instead of a less enthusiastic front office employee. Subscription based VoIP business phone systems theoretically kill two birds with the one stone. They offer unprecedented features along with much-welcomed reduced costs. The hardware, support and functionality of the VoIP telephone system are all covered under a single fee – no surprise service costs and no need to worry about maintenance or upkeep! You can get all of the advantages of an exceptional office telephone system’s features with none of the maintenance and requirements of owning your system outright. Wouldn’t it be great if everything in business was this hassle-free? A lot of people overlook the benefit of a subscription based VoIP telephone system for disaster recovery. In the event of a disaster, you need not replace any of the items as they are hosted remotely, and you can be back up and running to communicate with your valued team and clients in no time. Due to the varying quality of VoIP telephone system providers and the competition for your valued dollar, finding a provider for your subscription based VoIP telephone system is generally not that difficult. VoIP business phone system innovations and improvements just keep getting better and make this system more attractive to even old-school, traditional phone users. No matter what your profession or what industry you call home, a subscription based VoIP office phone system could make sense and offer attractive savings to your business budget.